We invite you to come out and watch and play Paralympic Sports including Wheelchair Basketball, Goalball, Adapted Cycling, and Power Soccer. 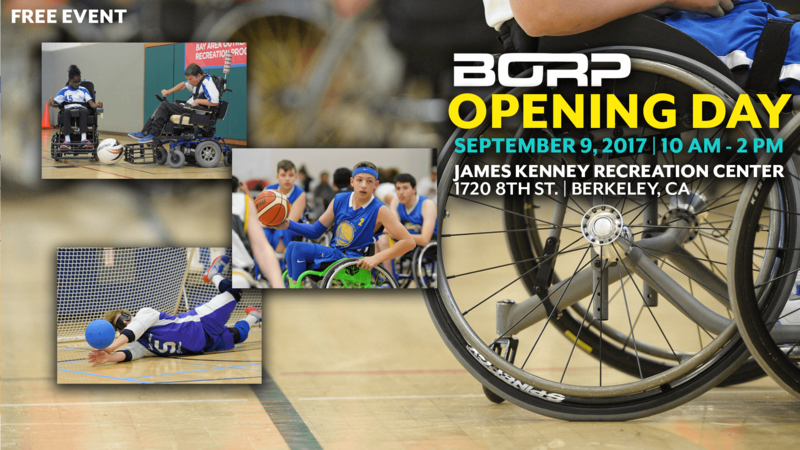 Get information on the new BORP Fitness Facility, the Sled Hockey Program, Jr. Adventures, and BORP’s new Wheelchair Racing. Please note: This is a free event, but your RSVP at the Eventbrite link listed here will help us best plan for food and drinks. The team practices on Fridays from 6:00-7:00 pm* at Oakland Ice Center (518 18th Street, Oakland, CA). Please arrive in time to get geared up and on the ice at six. *call Youth Sports Coordinator Trooper Johnson at (510) 225-7033 or email trooper@borp.org for exact times and locations as they are subject to change on short notice. Oakland Ice Center: 518 18th Street, Oakland, CA 94612. Through a partnership with Oakland Ice Center, BORP has created the only ongoing Sled Hockey Program in Northern California. Supported by grants from the Kristi Yamaguchi Always Dream Foundation and the National Hockey League’s Player’s Association, along with funding provided by the Guns ‘n’ Hoses Charity Hockey Game, we are able to provide custom sleds and equipment that allow kids with physical disabilities the opportunity to experience the sport of Ice Hockey.